After our really salty meal at The Smith and the sweet ballet at the Lincoln Center, we decided to grab some frozen yogurt at the neighborhood Froyo shop. The place was a little dirty by the time we got in, around 10pm. There were choco fixings and strawberry bits and yogurt splattered here and there. Guess I can't blame them because since they opened last year, they've been really popular, even during the wintertime. Guess the yogurt craze in NYC hasn't died down one bit. Nope, not one bit it seems. We were here on friday night, and there were a steady stream of customers. Hubby and I were both a little hungry after watching the show (it's draining on the mind you know! Especially with our high-area seating you really have to concentrate to catch all the action), so we got a bowl with pistachio, mango and cookies n cream yogurt. For toppings we got cookie crunch and mochi. There were no sample yogurt tasters like Red Mango, which was a big sad because I would have wanted to try their plain vanilla. We sat inside the little shop to enjoy our yogurt and chat, lest the yogurt melts by the time we make it back home. 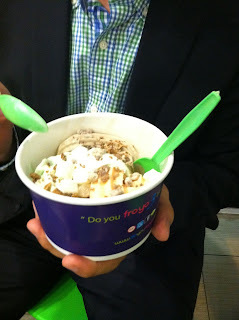 The cookies and cream froyo was pretty good, with a solid cookie-y taste amidst the soft sweet icy yogurt. But the pistachio was a little bland, without a strong evidence of pistachio. 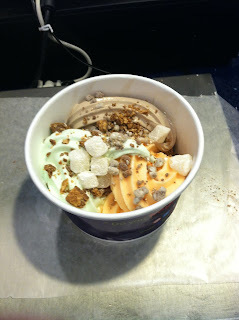 The mango was okay too, but I like Red Mango's mango better. Fortunately, the fixings worked really well with the flavors we got, because the cookie crunch provided a sweeter and crunchier texture against the pistachio, while the mochi worked nicely with the mango to create an interesting chewy twang. Would definitely come back here again, maybe even apply for a membership card.